Android Forums is the largest community dedicated exclusively to discussing Android Phones, Android Tablets, and Android Wear. 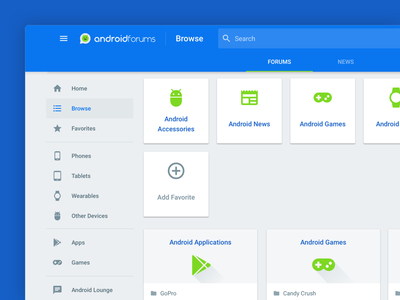 Android Forums approached us in need of a redesign and a fresh perspective on the current structure of their forum. The real challenge came in restructuring the forum nodes to be intuitive and allow for more fluid discussion. Embracing the tried-and-true format of Material Design, we utilized a sidebar menu that would include quick links to different categories, a user’s favorite subjects, and a full listing of nodes. This approach helped users navigate the forum with better ease without alienating members who were more familiar with the past structure.